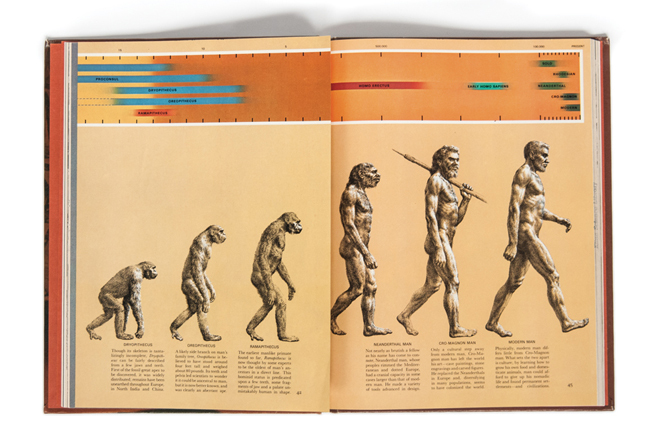 The March of Progress is the classic depiction of human evolution that, as the name suggests, literally has our ancestors marching to modernity. From origins on all fours, it shows a gradual transition to walking upright. Since its publication, this picture has become synonymous with our origins. There’s just one problem: it’s completely wrong. And not just because of its Eurocentric, male focus (gross). Or the implication that evolution is a linear progression (it isn’t). The real issue is that our ancestors didn’t knuckle-walk1. Instead, walking upright is way older than we thought; with hipster hominins doing it before it was cool. Alas, we’ve found few fossils from this crucial period, with even our oldest hominin fossils appearing to come after the transition towards bipedalism2. As such, researchers have had to look elsewhere to investigate the origins of walking upright. Many turned to our closest relatives, chimps and gorillas. Since both of them walk on their knuckles, it’s most likely their common ancestor was also a knuckle-walker and they just inherited that ability from them. As we’re so closely related, we would also share that ancestor too, ~12 million years ago. Which means we evolved from a knuckle-walker3. In other words, the main evidence for our knuckle-walking origin is that it’s the simplest explanation, involving the fewest evolutionary leaps. Knuckle-walking evolved once, then walking upright evolved once. A chimpanzee cannot walk upright like us. Our spine curves to keep our centre of gravity central, which is where it should be to keep us balanced, as the name implies. However, chimp spines aren’t flexible enough to do that. Instead, they have to shift their centre of gravity by bending their legs1. 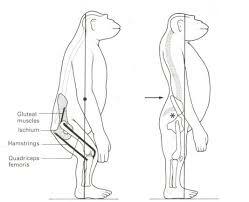 How chimps balance their centre of gravity (left) and how we do (right). Their lack of flexibility stems from the fact chimpanzees have lost a vertebra, shortening their lower spine. This keeps their back rigid, stabilising the body stable during knuckle-walking1. Both bonobos and regular chimps have this shorter spine. But crucially, evolution has achieved it in different ways. Chimps have fused two of their vertebrae together whilst bonobos have moved the spine upwards, shortening the lower part of it1. The spine of chimps (right), bonobos (centre) and humans (left). Chimps lost a vertebra at the horizontal arrow, everyone else shifted at the vertical ones1. This distinction might seem minor but has far-reaching implications. It shows these parts of their knuckle-walking anatomy are the result of convergent evolution, and not present in their last common ancestor. Similarly, they also share features with gorillas that arose through convergent evolution. For instance, both have hands that “lock together” to help transfer bodyweight through them, but they lock at different angles4. Chimp (left) and gorilla (right) hands, which lock at different angles4. In other words, gorillas, chimps, and bonobos didn’t inherit knuckle-walking from their common ancestor after all. Instead, they developed it independently after they diverged. All of which means we didn’t inherit it either. Our ancestors weren’t knuckle-walkers. So how did they move? 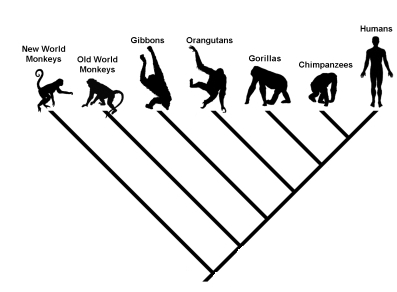 So, rather our last common ancestor with the other apes didn’t knuckle-walk. Instead, they had a form of locomotion that would go on to evolve into knuckle-walking. It would also eventually become our way of walking upright too. Given the range of different outcomes from this one group, many suspect it must have been very generalised. A “jack of all trades” whose way of walking was equally likely to evolve into all these different forms of locomotion, depending on the circumstances. A good candidate for this versatile body plan is actually walking upright. But not on the ground like we do, in the trees like an orangutan. An orangutan walking upright in the trees. 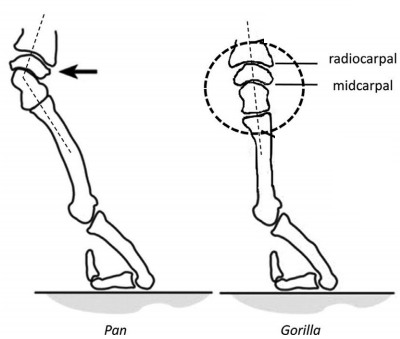 This flexible way of movement could easily evolve into the different forms of locomotion seen in other apes. In fact, orangutans can move like them surprisingly well. After all, they’re great climbers, travelling across the branches on both two and four legs (as well as swinging beneath them). When they descend to the ground, they can also switch between walking on two or four legs; along with the occasional bout of knuckle-walking depending on the circumstances4. In fact, they look eerily similar to us when walking upright. 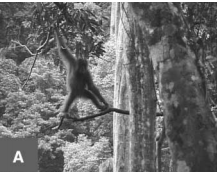 In other words, early great apes were walking upright, in the trees, as part of a flexible way of moving. Different descendants adapted it to their different circumstances. We took that upright component, and really ran with it. Literally. Zollikofer, C.P., de León, M.S.P., Lieberman, D.E., Guy, F., Pilbeam, D., Likius, A., Mackaye, H.T., Vignaud, P. and Brunet, M., 2005. Virtual cranial reconstruction of Sahelanthropus tchadensis. Nature, 434(7034), p.755. Richmond, B.G., Begun, D.R. and Strait, D.S., 2001. 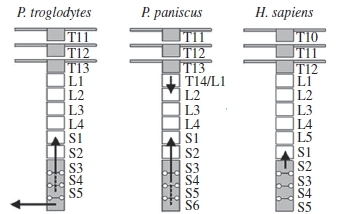 Origin of human bipedalism: the knuckle‐walking hypothesis revisited. American Journal of Physical Anthropology: The Official Publication of the American Association of Physical Anthropologists, 116(S33), pp.70-105. Thorpe, S.K., McClymont, J.M. and Crompton, R.H., 2014. 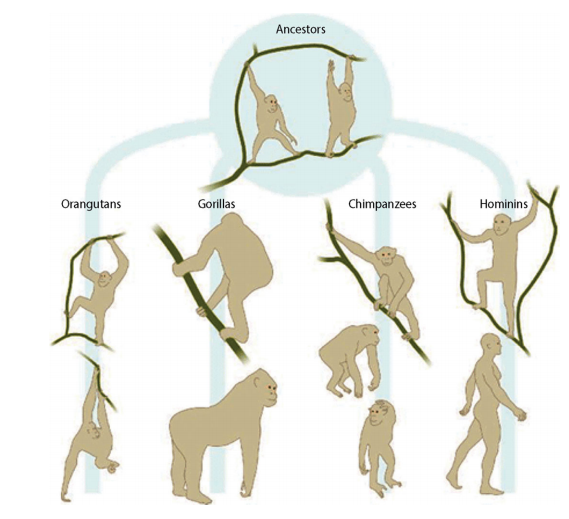 The arboreal origins of human bipedalism. Antiquity, 88(341), pp.906-914. Previous post: Chin up: why did humans evolve unique chins? Where can I find more information on this topic.? It’s really interesting. This is a relatively new idea so there isn’t that much in the popular media about it. As such the only way to learn more (to my knowledge) is to read the research papers on the subject. Anything by Lovejoy – lead author on this paper – is a good place to start. Well its interesting but why do some people and other racial group in our generation do not originate from chimps? And also considering the fact that, Chimps have fused two of their vertebrae together whilst bonobos have moved the spine upwards, shortening the lower part of it. Honestly, its a FALSE evidence no prove…. IF truly our ancestor where that we would have been seen chimps becoming HUMANS in our generation. Evolution is a process that takes several generations and often millions of years. We would not – and do not – expect to see significant transformations within chimps within a generation. If Chimp and Gorilla ancestors never walked upright why don’t they walk flat on their front feet like other primates. It seems logical to me that they evolved from an upright walking ancestor and went back to walking on all fours via the knuckles. They have extremely long digits for swinging through trees. Knuckle walking keeps them out the way.